Staging of traps back home. Pine resin all over Trap18. This will require extensive cleanup. First off think twice before you hang your traps in or near PINE TREES. Not all pines do this so it depends on the type. I don’t know my pine varieties very well, but some will leak sap/resin and others wont. Just be forewarned, don’t let this horrible sticky mess happen to you. If you are using a strap to secure the box to the tree make sure you take a screwdriver. After hanging on the tree all summer the ratchets sometimes don’t release as well as they did before being exposed to the weather all summer. I use the screwdriver to work the ratcheting mechanism a little to loosen the strap up. Once you get them all home lubricate them a little bit and put the straps away in a dry place until next year. All of the boxes still need to be opened and examined. I didn’t have time before I left. 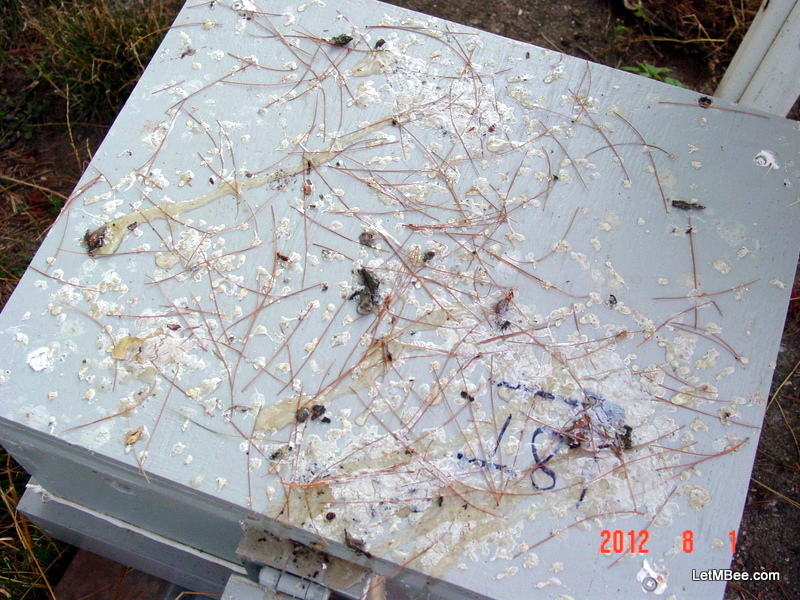 You can sometimes find evidence that a trap was occupied at some point, but the bees left for some unknown reason. This is important because you only want to continue putting traps in places you have had success. I also go through looking for any wax moth activity. In the event I find it the chickens will have a feast. Have you gotten your traps down yet? If not you probably should be thinking about it. 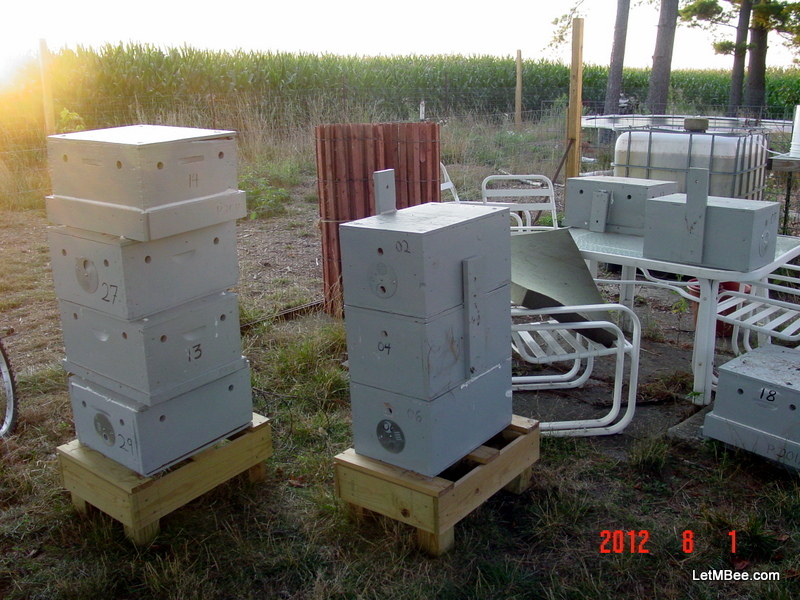 This entry was posted in Swarm Trapping and tagged bait hive, beekeeping, Indiana beekepeing, Jason Bruns, swarm trap, swarm trapping. Bookmark the permalink. Thanks for the reminder. Taking down the trap you sent me is on my list of things to do. I have been so busy in the bee yard and at bee conferences I have not had time for much else lately. I’m looking forward to the fall. I know the feeling. I was going to put up that post a week and a half ago, but had no Wi-Fi at the campground. I still have 8 traps that are out. Going to get all but one of them today. That is after I pick some green beans. I am bummed you had no luck this year with the trap. Were you made aware of any other swarms other than the one at your friend Debbie’s? Use the winter to seek out what might be a more productive spot. I was bummed too. Sam Comfort told me it was like fishing and I need to put up many traps until I find a good spot. I think making more traps will be a winter project for me. After I hung up your trap I heard rumors about several bee trees in the area. Hopefully I can put some traps near there next year. This has been a ridiculous year for swarming here. I guess I just picked a bad spot. The two swarms I caught at the end of May are now in 3 deeps and doing awesome! I recommend using old deeps if you are going to make traps. If you have any. Use ones with bad corners or some other defect. You can put 8 frames in an old deep and still have the 2″ x 2″s in the corners. That way if you don’t make it to check the trap for a week or two normally they still haven’t filled everything up. The swarming activity here was about what it has been the previous two years. I caught a couple more, but I think that is because I had more traps and I am getting a little better at it. I have learned that some places are definitely more productive than others. Once you find a productive trapping “ground” they are likely to repeat there year after year. That is great that on your swarms occupying three deeps in one season. That is impressive. You should have good overwintering success and dreams of a honey crop next summer!!! Next year I don’t think Ill put up any traps, my bee yard is as big as I want it for now, plus if I make divisions from my own bees I can select the strong ones and I don’t run the risk of picking up some guys treated stock. If you can find a couple sources for feral bees baiting is an excellent way of getting strong natural cell size feral stock though. I only say this because I might have caught “bred” bees since my two traps are so anemic compared to my own yards swarms. I am going to look into the legality in Indiana of selling bees that I capture in traps. A lot can change between now and March, but most of my colonies right now seem to be strong and I expect them to overwinter. I know that some of my bees have been caught from other beeks. Sad to hear your trap caught bees are not performing. I have been lucky I suppose, mine all seem to be performing well. I checked on about 1/2 of the hives on Thursday 8/23. For the time of year that it is, my bees are doing better than they ever have. My trap did not work either, but maybe because I put it in my own bee yard. It’s hard to find a place to put a trap around here without people freaking out. I’ll have to rethink my methodology, and figure out a better place to put a trap. I have found that you can hide them pretty easily from humans and the bees will still find em. There is a small town about 4 miles from my house that has several bee trees in it. It is the same town where the firehouse was. Don’t lose heart. It IS like fishing. The more you do it the better you will get. You will find good spots eventually. When you have success be thinking about other places that are similar in geography. As with all things in beekeeping there is a learning curve, but you will figure it out.